Oh yes this movie has moved me sufficiently to include it into my blog. Yes its a plain simple review but Something that needed to be shared. An award-winning documentary that Bollywood director Mira Nair weaves with inspiring true life characters and their personal experiences to leave a lasting impression on our souls, infusing us with valuable lessons all along the length of the movie. 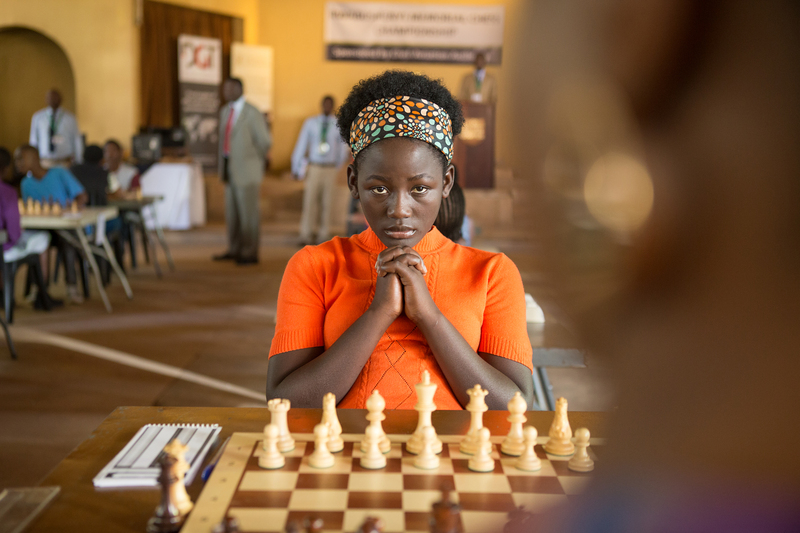 It’s about Phiona Mutesi a Ugandan Chess player. She was born in Katwe, the largest of Kampala’s eight slums. I have always been intrigued by watching people play chess, it is the brilliant agility of the mind of the players that draws me to the game like a bee to honey, but no I can’t play strategically well at all…at this point and space of time(no, that statement is not to bind me). All through the movie… we see Phiona and her family (Her two younger brothers and her single mom) struggling to live and have a roof over their heads (not figuratively!). You must know what it feels like to get splattered with a few drops of rain – it has joy and mirth en-wrapped in that vision for most of us. Well then picture- a house caving in, under torrential rain and the house filling up to its brim . How comfortable would it be to be drenched to one’s bone, when all one wants to do is sleep in the warmth of one’s bed? Mira piercingly portrays the misery through her characters and they in turn very naturally and profoundly depict the galvanizing tale (completely naked of any glamour akin to the movies). The strongest thread of the story is – the idea “that losing is not failure”. Success is the ablity to keep your head up… Not give up..
And search for that small lamp or flicker of light which burns up a new strategy…. a new way out of the distinctly desolate times – Here Phiona begins to believe that she is not her circumstances. She is trained by her coach to figure out a new way out of the challenging maybe even trapping move of her opponent on not just the chess board , but on the board of life! And she almost believes she has no way out of the heart wrenching poverty. Coach, you told us to make a plan but I fear things will never change. … Which is when she knows that chess is definitely her way out ! So she grits her teeth and decides to find a new way, a new move, every time she plays chess …. “Losing teaches me to play better. Oh but her mother Nakku Harriet, is the first beacon not flicker, nor lamp , but a mammoth beacon, who teaches her the biggest lesson- with her spirit of steel just by being who she is – a mother, who does not give up on her children no matter how wretched their circumstances were! Who embodies the principle- “Never get bitter, But try …just once more in a new way! !” We see the steel melt and bend and provide intelligently for her children. This is very apparent when – she cleverly but discreetly furnishes more paraffin, to facilitate the learning of chess in darkness of the night for the love of her life, her daughter Phiona. A love that is apparent merely by the actions of this simple but resolutely improvising mom. And her little girl writes history for not just herself but her own brothers and her weary mother!! Phiona Mutesi has won the Ugandan Women’s Junior Championship of three times, has represented Uganda at four chess olympiads, and is one of the first titled female players in Ugandan chess history. We have felt her heart beating next to ours, no matter how engaged we may be, if we quietened the noise inside, we could strangely feel it comforting us even today. She has looked patiently into our eyes trying to understand us..
Held us close in times that we were unsure..hold still, today too her eyes seek… And she is close..
She has raised her voice in fear… In exasperation … And oh in glee echoing just what we felt..today too each sound that leaves your voice box, has hers..
We have heard her move quietly and briskly at unearthly hours for those warm delicious meals…and the clean comfort of our home…today do you think you move alone? Have felt our tears blend, hers and mine, in times of despair, in times of joy… No matter where she is today, the drops trickling from our eyes still seem to blend..
“Alone”? – She has tried so hard so that we never knew what that word meant. Or does solely her thought accomplish all of that? That embraces her breath, the strength of her, the softness of her self, the beat of her heart, the tenaciousness of her spirit, the expansive reach of her being. Am i just me? Is she just her…. ?